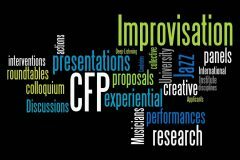 The International Institute for Critical Studies in Improvisation, in partnership with the Guelph Jazz Festival and the University of Guelph, invites proposals for presentations at our annual interdisciplinary international conference. The colloquium will take place September 13-15, 2017, as part of the 24th annual Guelph Jazz Festival. Featuring panel discussions, debates, performances, immersive experiences, a sharing of stories and best practices, and dialogues among researchers, artists, and audiences, the colloquium fosters a spirit of collaborative, boundary defying inquiry and dialogue, and an international exchange of cultural forms and knowledges. What can creative partnerships teach us about collaboration across sectors and genres? How have musical partnerships contributed to movements for social justice? What are the ways in which people and organizations learn, grow, and change through partnerships? What learning and innovation can grow from perceived failures? What methodologies come into play when musicians, artists, community members and academics come together? What kinds of code-switching happens and how does it foster or hinder growth and change? We invite proposals to present, discuss, and showcase your partnered and collaborative work and its impacts. We particularly welcome proposals focusing on the involvement of jazz and/or improvised creative practices in current movements such as the Dakota Access Pipeline, Black Lives Matter, Idle No More, and those working with youth. We welcome proposals for paper presentations, panel or roundtable discussions, musical and other creative performances, and experiential offerings such as arts workshops and multi-media presentations. Please indicate the format of your contribution and any technical or other resources you require. We also invite participants to submit completed versions of their presentations to be considered for publication in our peer-reviewed journal, Critical Studies in Improvisation/Études critiques en improvisation (www.criticalimprov.com). Download the PDF for the 2017 Guelph Jazz Festival Colloquium call for papers and presentations.